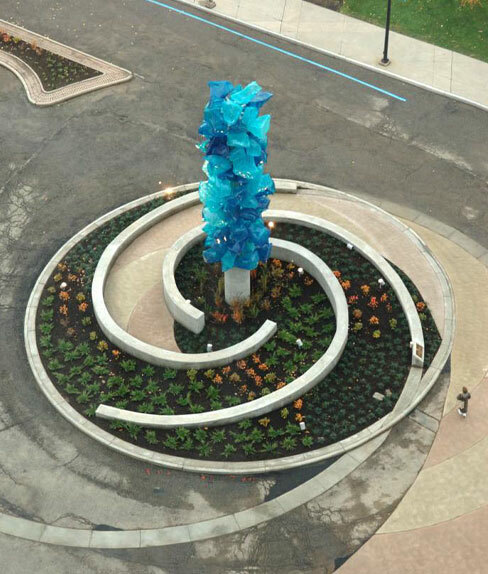 A fabulous landmark sculpture for The University of Akron has been created by artist Dale Chihuly which represents the convergence of science and art. Chihuly, best known for his revolutionary glass pieces and sculptures, has used a new medium transparent polyurethane which was developed and tested for weather-resistance and durability through the College of Polymer Science and Polymer Engineering. The results complement the Goodyear Polymer Center's reflective glass surfaces and will shine in Akron for generations to come. The sculpture consists of 80 individual "rocks" mounted to a center stainless steel armature. It is thirty feet tall and is secured to a 10-foot tall cylindrical base of reinforced concrete, making the sculpture a little over 40 feet tall. The landscaping at the base is modeled after the spiral curves of the chambered nautilus, one of nature's more perfect designs. It contains a spiral walkway and retaining walls with occasional seats. Included within the attractive plantings are lights which illuminate the sculpture at several grazing angles on all sides. A hidden security system also is incorporated along with thorn bushes near the base. The molds for the blue, transparent "rocks" are made by modeling in plaster, in large scale, from small pieces of broken glass. The plaster model is coated with a silicone liquid which thickens to make a precise mold of the features of broken glass. After removal of the plaster model, the exterior of the rubbery mold is backed with a stiff composite shell which has been sectioned and bolted together to make a rugged final mold, ready to be charged with the liquid urethane and rotated around several axes to form the final blue rock. The "rocks" are made of a UV stable, rigid polyurethane, rotationally molded from a two-component liquid mixture which is poured into six different molds at Chihuly Studios in Seattle, Washington. After rotating and coating the inside of the mold with the liquid, the thick polymer layer solidifies to a hard consistency. Each rock is then post-cured in a large oven to harden the material further. A cylindrical stub is concurrently molded into one face of the rock, producing the means by which it is later inserted into tubes welded to the 30 ft. center armature. The sulpture was financed by private contributions. The polymer materials were donated by BayerMaterialScience AG and a grant from the Ohio Arts Council provided the creative landscaping and lighting. Click here for a time-lapse video of the construction of the Chihuly sculpture.